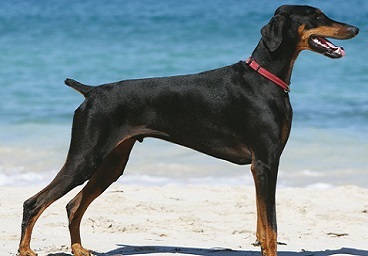 The Dobermann is mostly portrayed as a tough guard dog and often had their softer side ignored. With the right training and socialisation Dobermann puppies make good family pets. Dobermann, also frequently spelt as “Doberman” puppies, can grow on average to 24″ to 28″ (61 to 71 cm) and a grown Dobermann will weigh between 66 and 88 pounds (30 to 40 kg). With a variety of colours including black and tan, blue and tan, brown and tan and also fawn and tan, Dobermann puppies have a smooth short coat that needs little care. The Dobermann is not suited to apartment life but can adapt quite well to living in a town environment, as long as they have a secure garden and also free exercise time off the lead. Dobermanns are highly intelligent and quick to learn and can sometimes be seen to be one step ahead of the handler. Dobermann puppies can make a wonderful family dog but a lot of training and socialisation is needed. All Dogs4Us Dobermann puppies come with a six month guarantee and are temporary vaccinated, wormed and microchipped for identification. Please call us prior to visiting should you be interested in buying a Dobermann puppy, so we can check availability. To find out more about Dogs4Us Dobermanns and to check availability contact us at Dogs4Us. Take a look at some of the Dogs4Us Dobermann in their forever homes and don't forget to upload your Dogs4Us Dobermann snaps to join our family galleries.